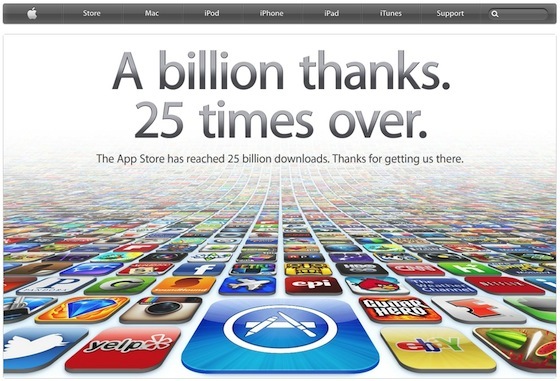 The Apple App Store reached an amazing milestone today with cumulative app downloads surpassing 25 billion for the first time in the store’s history. The rate of downloads on the App Store has been increasing exponentially – while the first 10 billion downloads took two and a half years, the last 10 billion have taken just eight months. Apple launched a “25 Billion App Countdown” contest last month to celebrate the achievement, with $10,000 in iTunes Store credit going to the individual who downloaded app number 25 billion. The winner is yet to be announced.